Yesterday we told you that Absinthe v0.3 was released for the Linux operating system. With Absinthe now working on Linux, this means users who own a Linux computer, can now Jailbreak their iPhone 4S running the iOS 5.0 firmware and both versions of the iOS 5.0.1 firmwares (9A405 and 9A406). In this how to from iJailbreak.com you will learn how to Jailbreak your iPhone 4S running the iOS 5.0 and both versions of the iOS 5.0.1 firmwares with Absinthe for Linux. Perquisites: The very first thing you need to do before starting this how to guide is make sure your iPhone 4S is backed up. As the Absinthe Jailbreaking tool was only recently released, there is a good chance that you may experience an error Jailbreaking it. Thus, it is always a good idea to make sure all your content on your iPhone 4S is backed up. Additionally, if you iPhone 4S has a passcode lock you must disable it, and furthermore you will need to disable any current VPN’s setup on your iPhone 4S. Note: Please keep in mind that these commands are for Ubuntu (the form of Linux I am using), and may not work with other forms of Linux. Additionally, if you are having troubles please click here, or go to the official libimobiledevice by clicking here. 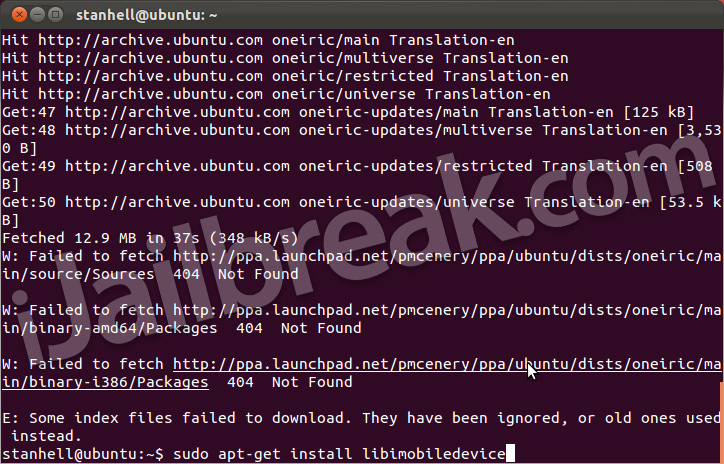 Lastly, if you are getting errors with the last command, you may need to go into the Ubuntu software center and search for libimobiledevice. Step 2: The next thing you will need to do is download the latest version of the Absinthe Jailbreaking tool from the iJailbreak Downloads Section or from one of the direct download links below. It is always recommend that you check the iJailbreak Download Section, however, to ensure that you are downloading the latest version (we do not always update these guides with the up-to-date versions). Step 3: Launch the Absinthe Jailbreaking tool, from the directory you downloaded it to, by clicking the Absinthe app shortcut. If you are confused about which version to launch please keep in mind that for x86 machines you will want to use the absinthe.x86 shortcut, and for 64-bit machine you will want to use the absinthe.x86_64 shortcut. Step 4: Once Absinthe is running you will need to plug your iPhone 4S into your computer (if you have not done this already). Upon doing this Absinthe should recognize your iPhone 4S, and once this happens, you will need to click the Jailbreak button in the middle-right side of the screen. Step 5: Once your iPhone 4S reboots you can slide-to-unlock it and then on your SpringBoard (homescreen) you should notice a new Absinthe icon. Tap this Absinthe icon now, the official GreenPois0n website should appear for an instant, and then your iPhone 4S will reboot. Upon being rebooted you should notice that Cydia takes the place of the prior Absinthe icon. can i restore back to factory without a issue if i have to take it to the apple store? Newb question: how do I launch the program? Double clicking on the x64 program doesn’t do anything, and when I tell it to open using software centre, it doesn’t recognise it as a program. Thanks.